Located in the town of Eklingji (Kailashpuri), near Udaipur in Rajasthan, the Eklingji Temple was constructed in 734 AD and houses 108 temples within its complex. 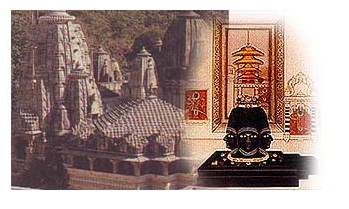 Lord Shiva is the principal deity of the Eklingji Temple and the temple is built of marble and sandstone. The Maharanas of Mewad believe that it was Lord Shiva or Eklingji who had saved them and therefore call themselves as the secretaries or Maharanas of Eklingji. Parambrahma or Lord Shiva is the principal deity of the Eklingji Temple. The word Parambrahma literally means ‘the wholesome one’, which signifies that Lord Shiva is the creator, preserver and destroyer of everything. The statue of Eklingji is five faced and consists of the faces of Lord Brahma, Lord Vishnu, Lord Surya and Lord Rudra with a Shivalinga in the middle. As per the popular and extremely significant historical document The Annals, there is a full chapter dedicated to the spiritual inclinations of the Rajputs in Mewar. The chapter states that the only phallic manifestation of Lord Shiva is located at Eklingji. The Ranas of the region are merely the Diwan or the Prime Minister of the Lord. As per another inscription discovered in the storeroom of the Eklingji Temple, Lakulisa, a form of Lord Shiva, was worshipped in this region. The followers of this sect were known as the Lakulisa-Pasapatas. Built in 728 AD by Bappa Rawal, the Eklingji Temple was established by Acharya Viswaroopa (A contemporary of Adi Shankaracharya). The Eklingji Temple is also believed to be the very place where Bappa Rawal was believed to have received religious discourse from Harit Rishi. The temple was later renovated in the 15th and 16th Century by Maharana Raimal. The temple was highly damaged when Alauddin Khilji attacked the region in 1303. However, the major renovation work on the temple was initiated and patronized by Maharana Kumbha. Maharana Kumbha’s architect Madan, played a crucial role in the renovation efforts. Besides Kumbha, Maharana Raj Singh and Maharana Bhim Singh also dedicated a lot of resources in this renovation effort. As per legend, Lord Indra became extremely ill after committing the sin of killing Brahmin Vrutrasur. Lord Indra started worshipping Lord Eklingji, as per the advice of Acharya Bruhaspati and was soon relieved of the fever. As per another legend, Kamdhenu Nandini, scared of Vishvamitra’s army, sought the shelter of Lord Eklingji. Later he was able to successfully overcome the army of Vishvamitra. Cobra Takshaka, frightened by Janmejay’s serpent sacrifice, sought the shelter of Lord Eklingji. Here Takshaka built a Kunda which was also known as the Takshaka Kunda. Bappa Rawal, the founder of Mewar dynasty, was blessed by Lord Shiva in a dream, and in his honor Bappa Rawal built the Eklingji Temple. It is also believed that Lord Shiva had directly empowered Bappa Rawal to establish the Mewar dynasty. The Eklingji Temple is considered to be of immense cultural significance, owing to the fact that it was built by the founder of the Mewar dynasty, Bappa Rawal himself. The architecture of the temple is also believed to be the first amongst the chain of temple to follow, which would be inspired by this style of architecture. Spreading across an area of 2500 square feet and a height of 65 feet, the Eklingji Temple complex has 108 temples, representing the 108 beads of the rudraksh necklace of Sadhus. The temple is essentially double storied and its main temple hall or mandapam is intensively pillared. The image of Mahadev with four faces and made of black marble is ardently worshipped as Lord Eklingji or ‘with one lingam’. On entering the main hall, just beside the silver image of Nandi, there is a statue of Bappa Rawal with folded hands. Inside the temple complex, there is also another temple known as the ‘Nathon ka Mandir’. In this temple no pooja or ceremonies are performed. The interior of the Eklingji Temple is extremely exquisite and has a number of highly ornamented doorways and screens. The Shivalinga is encircled with the images of Lord Ganesha, Goddess Parvati and Lord Kartikeya. The temple complex also hosts a couple of tanks namely Karz Kund and Tulsi Kund. Vedic and Tantric styles of worship are performed during the daily rituals. Some of the major temples inside the complex are Sas-Bahu Marble Temple, temples dedicated to Amba Mata, Kalka Mata and Lord Ganesh, Abhudji Jain Temple, Pataleshwar Mahadeo Temple, Arbada Mata Temple, Rathasan Devi Temple and Vindhyavasini Devi Temple. Mewad Mahotsav: This festival celebrated during the months of March-April, especially by children and women. Mahashivaratri: This is the main festival of the Eklingtji Temple and is celebrated with great pomp and fervor. The images of Lord Shiva and other deities are embellished and lavishly decorated on this occasion. Shilpgram Fair: This fair is organized during the months of November and December in the Dakshin hawala Village. The art and culture of Rajasthan is showcased in this fair.